Home > Synchronous Belts > One Sided Timing Belts (Single Side Synchronous Belts) > HTD Timing Belts. Round (Curvilinear) Tooth Profile > 351-3M-9 Synchronous Timing belt. 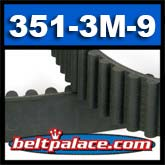 351-3M-9 Synchronous Timing belt. DDG Brand. 117 Teeth. 9mm Wide (3/8" Wide). 351mm Length (13.8" OC). HTD "round" tooth profile. RICHENG 351-3M x 9mm Wide Belt. (Gates) UNITTA BELT 351-3M x 9mm wide. This HTD 351-3M-9 belt replaces the non-existent "RICHENG 352-3M-9" BELT. Those belts were incorrectly labeled from the factory and do not equal any real belt size. 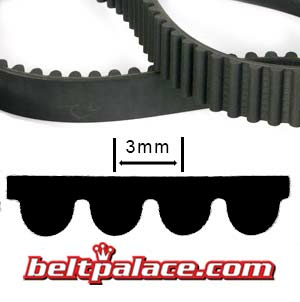 HTD 354-3M-9 Synchronous Timing belt. DDG Brand. 354mm Length, 3mm tooth pitch, 9mm wide. 118 Teeth. Drive Belt (motor) for Chicago Electric 69820 4x24 hand held belt sander. MODEL 97593.